At the weekend I attended an emergency services open day and was interested to see all the support teams and equipment the police had. There were rapid response teams, dog handlers, traffic investigators, mounted police to name but a few. Their equipment included drones, dogs horses, guns, fast cars and much more besides. I then came across a newspaper report from 1883 regarding the theft of two ducks and a serious assault on a local policeman. It just goes to show how brave these men were especially when considering that to all intents and purposes there were no rapid response teams to come to their assistance should they ever be in danger. The best they could hope for was some help from local people which in some cases was never forthcoming. Armed with nothing but a helmet and staff they were expected to bravely face up to often drunken men and women armed with numerous types of weapons and all hell bent on not getting arrested. On the evening of Thursday the 18th of January 1883 three men; George Dodd, John Dodd and George Aggett, all labourers from Chagford, were drinking at The Sandy Park Inn near Drewsteignton. Having spent the time between seven o’ clock and eight o’ clock enjoying their favourite tipples they were seen to leave the inn. However half an hour later one of the inn owner’s (Mr. Richard Brock) workmen heard a proper kerfuffle going on in the cow shed. As this was where Mr. Brock kept his ducks he went to investigate the cause, thinking that maybe it was a fox. As he approached the cow shed door he saw George Aggett coming out and immediately reported the matter to the inn keeper. The pair then went into the cow shed and discovered that two of their ducks has disappeared. Coming to the conclusion that Aggett had stolen them Mr. Brock with two workmen then proceeded to Chagford and the house of P. C. Tucker where they reported the theft. It was here that they demanded that the constable should arrest the villains and so P. C. Tucker set off in pursuit. At around ten o’clock he came to the house of John Dodd and as he passed the window he saw Dodd’s wife plucking something on the table along with a pile of feathers. He knocked the door which was then answered by John Dodd and noticed that George Dodd and George Aggett were also in the house. As he entered the room P.C. Tucker spotted Dodd’s wife frantically rushing upstairs with something in her hands. 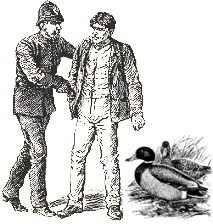 The constable then told the three men that the reason he had come to the house was to arrest the three men for the theft of two ducks belonging to Mr. Brock. As one might suspect John Dodd denied the theft and stating that there were no ducks in the house he may search it if he liked. Calmly Tucker asked the men why there were two grey and two white ducks wings and two legs on the table and why there were feathers scattered all around the room. Having received no plausible answer he then informed the three men that he was going to take them all to Moretonhampstead police station. At this point all three sprang to their feet and one yelled; “You ****, you shan’t have the ducks nor us either. We’ll kill you before you leave the house.” The three men then set upon the constable and the ensuing melee ran out into the road giving him a good shoeing on the way. P.C. Tucker somehow managed to restrain John Dodd but the other two men continued on kicking the constable so much so that John Dodd managed to free himself, all three men then dashed back into the house. 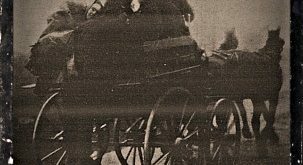 I would imagine that if such an event occurred today back-up would soon be on the scene to give assistance but back then the cavalry and their blue flashing lights were a mere pipe dream. So it was clear that he needed some kind of assistance and so he managed to enlist the services of James Rice, a local Chagford landlord and good old Mr. Brock. By this time more of Mr. Brock’s workmen had joined the posse and were sat in the cart with the prisoners. However, unbeknown to anyone John Dodd had a concealed knife about his person with which he somehow managed to cut his ropes. Having done so he immediately attacked one of the workmen and managed to stab him in the finger whilst also stabbing another. Another minor rumble took place in which P.C. Tucker managed to take the knife away. As a finale George Dodd then screamed that; “if I could get hold of a knife I would ‘stick’ Tucker with it.” The posse, cart and it’s load of prisoners eventually reached Moretonhampstead police station where they were safely locked up behind bars. So just for the sake of two stolen ducks the eventual list of injuries was quite extensive. On that night Doctor Albert Dunning Hunt from Chagford treated both Mr. Brock and Mr. Rice for injuries sustained in a heavy club attack, James Garrish for a stab wound to his finger and last not least P.C. Tucker for numerous injuries including the wounds caused by the fire shovel and chopper. The doctor stated at the time that if Tucker had not been wearing his helmet then his wounds would have proved fatal. On the 22nd of January 1883 the three men were brought before the magistrates at the Moretonhampstead Petty Sessions. where they were charged with stealing two ducks from Mr. Brock and committing; “a most violent assault on P.C. Tucker.” Apparently P.C. Tucker appeared at the court with a livid black eye, several bruises and walking with a limp. The Dodd brothers also appeared battered and bruised and covered with strips of sticking plasters. On the magistrates table were exhibited the weapons with which P.C. Tucker was assaulted; a heavy blood-stained bludgeon, an iron chopper and an iron bar which was seven pound in weight. The mystery of the missing ducks was also revealed during the hearing. On entering Dodds’ house for the second time P.C. Tucker found that the duck’s wings and feather had been thrown onto the fire where they were burning. Also the entrails of the ducks had been hidden in George Dodds’ pocket and thrown into the street as he was being delivered to the police station. The day following the event portions of duck were found in a nearby meadow hidden under a bush. The outcome of the hearing was that the bench committed the prisoners for trail at the next court sessions. At the court hearing a very weak case for the accused was put forward and the jury found the prisoners guilty as charged. The Judge then commented that this was not the prisoners first offence as there had been many convictions against them for assaults. He then went on to say that they had in this case been guilty of, “very ruffiantly conduct towards men who had acted with courage in nothing more than the exercise of their duty. To suppose that policemen were to stand by and be smashed about or murdered was ridiculous. They were getting in this country to a kind of sentimentality which strikes at the root of manliness. If it were not for policemen everybody would have to carry revolvers and fight for themselves, and the state of things would be a continuous warring against each other.” The final outcome being that all three were sent to penal servitude for a period of five years – all for the sake of two ducks?